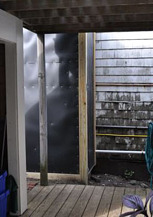 Using 4 x 4 posts and Acoustifence material, Provincetown, Massachusetts contractor Deborah Paine built a framed noise barrier to block the ear-piercing sound emanating from a Restaurant situated just feet away from a neighboring three-story apartment building. PROVINCETOWN, MASS (USA), SEPTEMBER 12, 2011 – Residents of a small apartment building set just three-feet from the high decibel exhaust fan of a neighboring restaurant are sleeping easier tonight, thanks to a newly constructed sound barrier utilizing Acoustifence noise abatement material that cut the noise in half. After discussing soundproofing options with Steve Hibbens, an acoustical consultant at Acoustiblok, Inc. in Tampa, Florida, Provincetown building contractor Deborah Paine, who happens to reside in the affected apartment building, collaborated with the building’s owner and the owner of Sal’s Place Restaurant to design and build a noise barrier enclosure around the fan. Using pressure treated wood to create a support structure for the Acoustifence soundproofing material, Paine built a nine-foot-tall structure, with a hinged door to provide access for maintenance of the fan, and an exhaust port at the top of the unit facing the street, to provide unrestricted air flow. The 1600 CFM industrial exhaust fan was installed midsummer, when Massachusetts was already experiencing record-breaking temperatures exceeding 97-degrees. Measuring 75 decibels, the fan was so loud that apartment residents had to close their windows despite the scorching weather just to get relief from the noise and greasy air blasting directly at their apartments from the fan. Paine, owner of Deborah Paine, Inc., a design/build firm in neighboring Truro Massachusetts, says she has designed and installed soundproofing in previous projects over the years. She decided to use Acoustifence, a product of the Acoustiblok Corporation, for the first time with this project. “We have purchased noise attenuation material from a Connecticut company in the past, but they’re phenomenally expensive and it turns out that the Acoustifence is a better quality material and more resilient than what we had purchased from the Connecticut company in the past,” she said. The results, Paine says, are even better than they had hoped for. “We can open our windows, and we can sleep at night,” Paine said of the 50- to 60-percent noise reduction provided by the single layer Acoustifence noise barrier. Paine used a decibel reader to capture before and after noise levels, which measured 72- to 75-decibels before the Acoustifence noise barrier was put in place, and 62-decibels after. Translated in terms of perceived sound, a 12-decibel reduction cuts the noise level by 56.4-percent, and a 15-decibel reduction cuts noise by 64.64-percent. 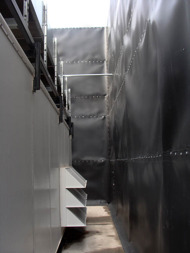 “This is a creative and effective application for Acoustifence, which ordinarily can be hung on an existing fence,” said Lahnie Johnson, president of Acoustiblok, Inc.
A 1/8-inch (3mm) thick unique sound deadening material measuring 6-feet (1.82 meters) high by 30-feet (9.14 meters) long with black anodized brass eyelets along the top and bottom edge for easy attachment to any existing fence or structure. Heavy-duty nylon ties are included with each roll. Easily installed or removed in less than one hour, impervious to mold, mildew, and UV, Acoustifence is virtually indestructible. 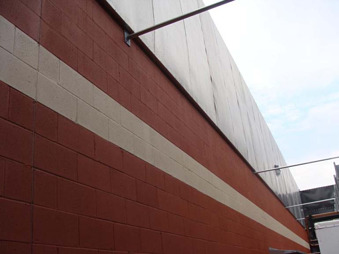 The soundproofing material in Acoustifence is a proprietary formula of the Acoustiblok Corporation, developed and refined over a 10-year period. Acoustiblok, Inc. now has available high quality landscape attachments which fit directly over the Acoustifence to provide a realistic landscape appearance. A variety of landscape attachments are available to choose from, including floral gardens, green meadows, English garden walls, and other scenic illustrations to blend into any natural backdrop or enhance an unfinished yard or property. Acoustiblok is recognized and sold worldwide, earning product awards from the British House of Commons, as well as being one of NASA’s Top 49 Spinoff companies. Acoustifence has proven performance in highway and high speed rail environments, construction sites, and industrial plants, and can accommodate any height fence or structure by simply overlapping the sections. To store, Acoustifence sections simply roll up like carpet. Independent lab tests of the Acoustifence material show a sound transmission classification (STC) of 28, which represents to the human ear an approximately 85-percent reduction in sound. However, results will be less, relative to surrounding sound reflective objects such as buildings or trees and the amount of Acoustifence installed. For more information on Acoustifence, visit the website, call 813-980-1400, or email sales@acoustiblok.com.